Siltreen is the eastern region of Deshaan. It includes the towns of Selfora and Silent Mire, as well as the Tal'Deic Fortress. The Siltreen Dolmen is located just south of Silent Mire in the southeastern corner of the region. 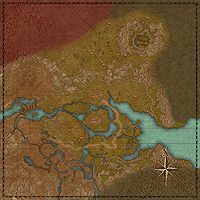 It is bordered on the north and south by Stonefalls and Shadowfen respectively, but there are no gates to either here. The region of Lagomere forms the western border. These side quests count towards the Deshaan Adventurer achievement. For Pact storyline quests which also contribute to this achievement, please see Deshaan Quests. A Blow for Order: Help the Ordinators get the upper hand against the Daedra. Cold-Blooded Vengeance: Help an angry Argonian take revenge on some Khajiiti pirates. A Fair Warning: Retrieve a Daedric artifact for a scholar. The Ravaged Village: Recover the sacred relics of Silent Mire. The Saving of Silent Mire: Free the pirates' captives at Silent Mire. Strange Guard Beasts: Rile up the wasps into attacking the Khajiiti pirates. Supply Run: Recover healing supplies for the wounded of Selfora. Vox Slayer 15 Kill Magistrix Vox at Eidolon's Hollow and restore peace to Deshaan. This page was last modified on 10 May 2017, at 11:49.